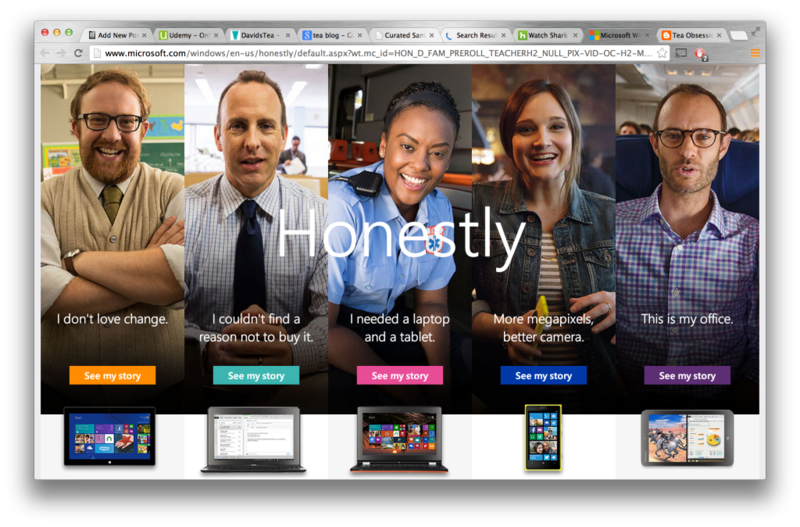 If Microsoft had an equivalent to Apple’s landmark “1984” ad, this ad would be it. Microsoft’s new ad, “Child of the ’90s”, aims to sell internet explorer, or rather, to reintroduce it. Using outdated items like Floppy disks, bowl cuts, and neopets, Microsoft forces nostalgia at the world’s most popular browser of the 1990s, Internet Explorer. And then, Microsoft slices through the delusion that internet explorer is stuck in the 1990s, by reminding us how much we’ve changed ourselves since then. I’ve been highly critical of Steve Ballmer, and of Microsoft’s past advertising, but this ad is a really impressive showing of what they’re capable of – actual creative thought, and effective advertising. In just about two weeks, the ad has garnered nearly 50 million views on Youtube, going megaviral. Even more impressively for them, the average response is overwhelmingly positive, with 89,000 likes to 17,000 dislikes as of this posting. It’s only a small glimmer in a sea of dung (see example below), but it’s a positive sign that perhaps Microsoft’s new chief executive, Satya Nadella, won’t have such a difficult time changing his company’s image for the better. Why do I absolutely detest the ads tied to this? They broadcast the absolute wrong messages for Microsoft. The first guy reminds me of that teacher everybody hates for being a hard you-know-what. He’s resistant to change, and old fashioned. He even says that word for word. The fact that he likes the new surface doesn’t inspire confidence for students. Even worse, his ad is full of conflicting messaging. He’s old fashioned, but he raves about his students can play games and Skype on the tablets. Are they marketing it to students, or teachers and administrators? They need to take their pick. The second guy reminds me of a hard you-know-what boss. If you’re a fan of the series “Arrested Development”, think Gob as the President of the Bluth Company. If you’re not a fan, start watching it now on Netflix. Once again, his ad is filled to the brim with conflicting messaging. The paramedic ad I don’t mind, though it’s still not “fantastic”. The fourth ad, labelled “More megapixels. Better Camera”, is rough in two ways. First of all, it’s technically incorrect, because more megapixels doesn’t always correlate to a better camera. Second of all, most people buying a phone have no clue what a megapixel even is. Apple eats their own dog food – they filmed their commercials entirely on iPhones. Apple’s ads showcase the product while telling interesting stories. Microsoft really needs to give this a try. Phones are becoming a commodity, and emotional ads are going to be critical in winning over users of other phone platforms. The last ad, I can’t even remember, so I can’t comment on, but hopefully I’ve conveyed my point. Microsoft needs to focus, and get creative, as they did in the Internet Explorer ad. As they did in that ad, they need to emotionally connect to consumers, and make their case in a new way. Can they successfully transition to good advertising?